Communication Skills For Entrepreneurs is.. 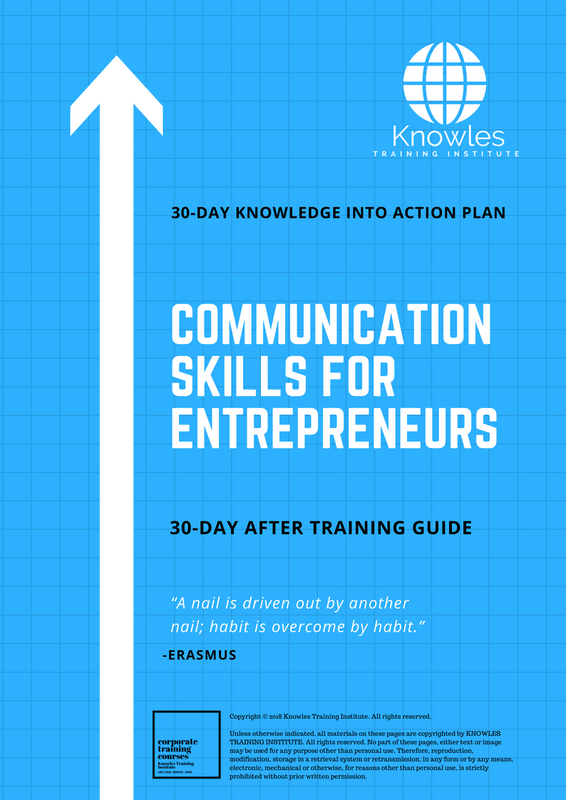 This Communication Skills For Entrepreneurs workshop is ideal for anyone who would like to gain a strong grasp and improve their Communication Skills For Entrepreneurs. 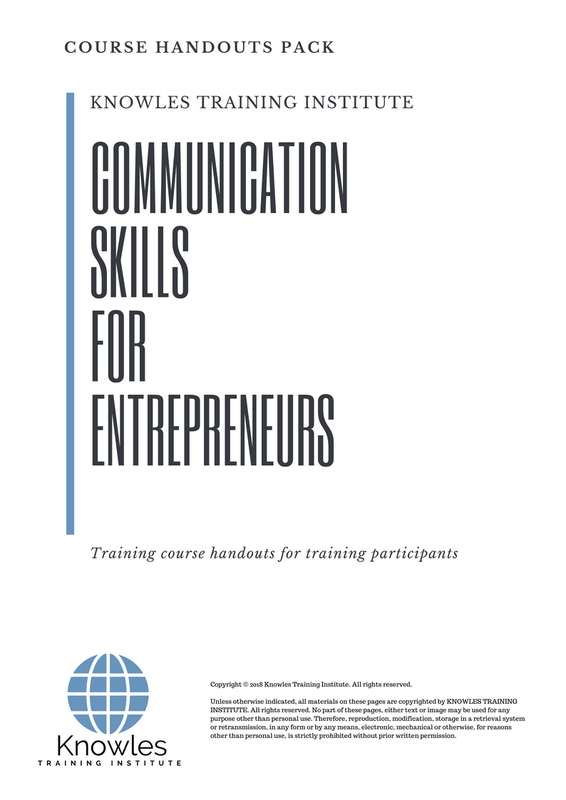 The duration of this Communication Skills For Entrepreneurs workshop is 1 full day. Knowles Training Institute will also be able to contextualised this workshop according to different durations; 2 full days, 1 day, half day, 90 minutes and 60 minutes. Develop the participants’ capacity to effectively communicate both verbally and non-verbally. Enable participants to resolve customer issues with confidence and to satisfaction through effective communication. Enable participants to build long term relations with business partners and customers. Entrepreneurs will gain effective communication skills to market and sell products. Incorporate effective communication strategies to build a better image for the organisation. Acquire the ability to write customer focused emails and plan customer focused meetings. The training on communication will lead to employees and entrepreneurs with better communication skills. 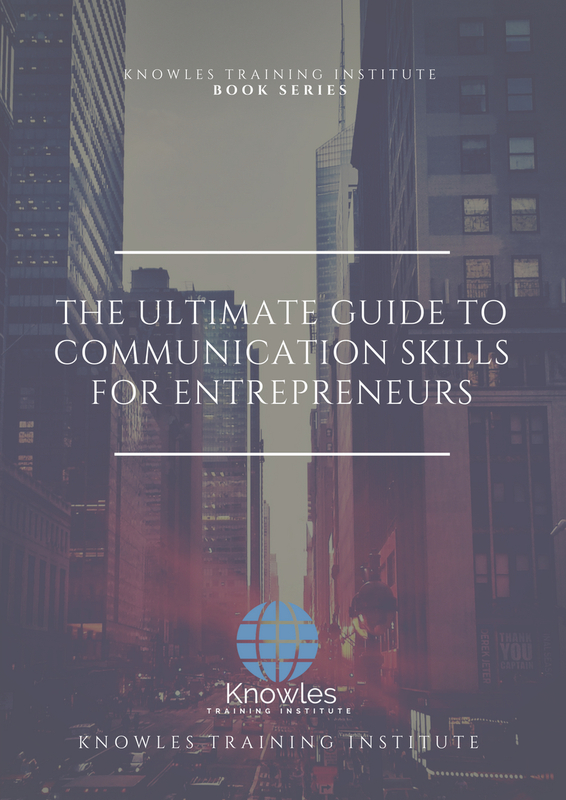 Define the term communication and explore the importance of communication skills for entrepreneurs. Explore the various methods of communication available for entrepreneurs and their impact on business. Discuss the verbal and non-verbal communication methods, their benefits and disadvantages. Understand the significance of applying effective communication skills in expressing business ideas, closing business deals and negotiating for business for entrepreneurs. Learn the different ways entrepreneurs can employ effective communication skills to pitch business ideas with purpose and clarity. Appreciate the role of communication skills in delivering the business vision, mission and accomplishing business goals. Understand the importance of communication skills in identifying customers’ needs and responding to the identified needs. Establish the most appropriate communication channels and messages for reaching out to customers about business services and products. Understand the importance of writing and presentation skills in building business partnerships that result to business growth. Understand effective communication as a means to building positive and long lasting business relations with clients, business partners and business teams. Appreciate the role of effective communication skills in servicing and retaining customers. Establish proper methods of handling complaints and collecting feedback from customers. Discuss the meaning and the importance of communication skills for entrepreneurs. 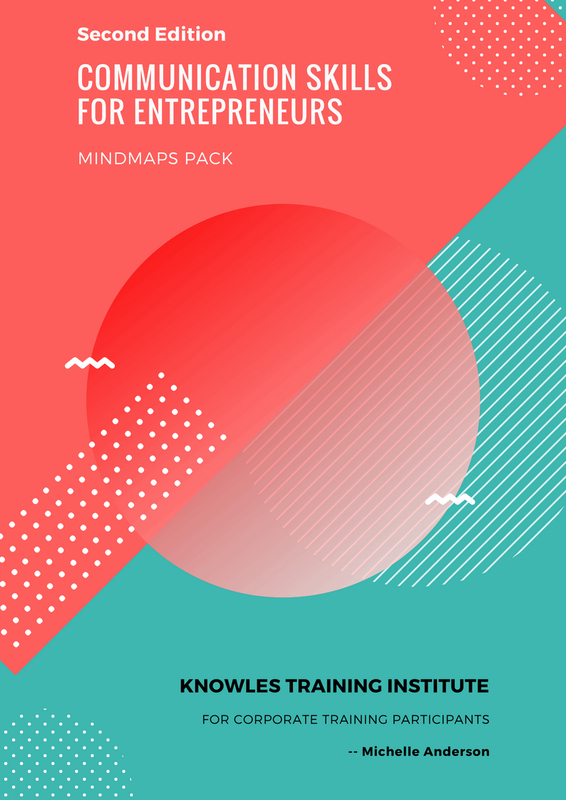 Outline the various methods of communication available for entrepreneurs to run and manage businesses. Identify the verbal and non-verbal communication methods, their benefits and disadvantages. Discuss the meaning and significance of effective communication skills in expressing business ideas, closing business deals and negotiating for business for entrepreneurs. Discuss the different ways entrepreneurs can employ effective communication skills to pitch business ideas with purpose and clarity. Discuss the significance of communication skills in delivering business vision, mission and accomplishing business goals. Discuss the importance of communication skills in identifying customers’ needs and responding to the identified needs. Identify the most appropriate communication channels and messages for reaching out to customers about business services and products. Discuss the importance of writing and presentation skills in building business partnerships that result to business growth. Discuss the importance of effective communication in building positive and long lasting relations with clients, business partners and business teams. Identify the role of effective communication in servicing and retaining customers. Discuss proper methods of communicating complaints and collecting feedback from customers. 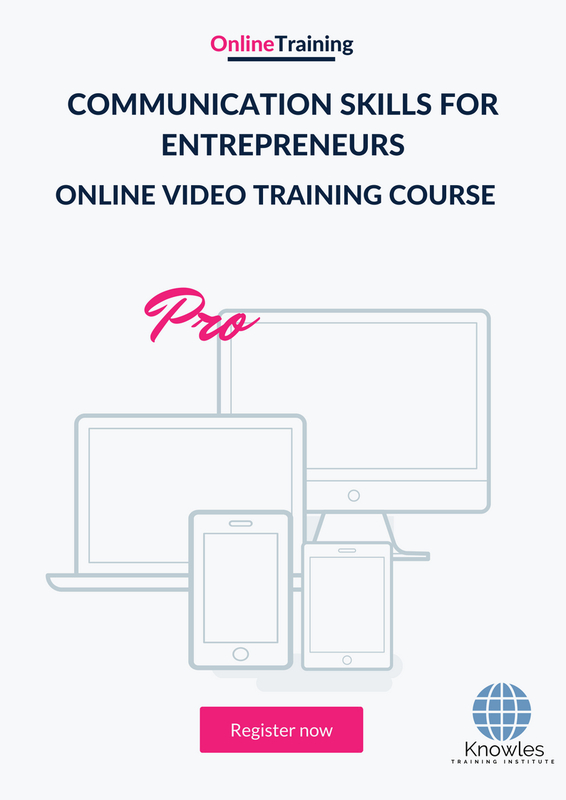 There are 3 pricing options available for this Communication Skills For Entrepreneurs training course. 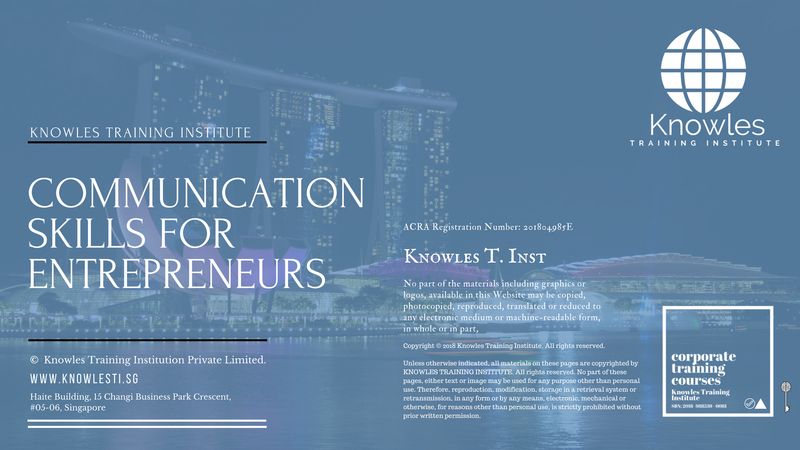 Course participants not in Singapore may choose to sign up for our online Communication Skills For Entrepreneurs training course. 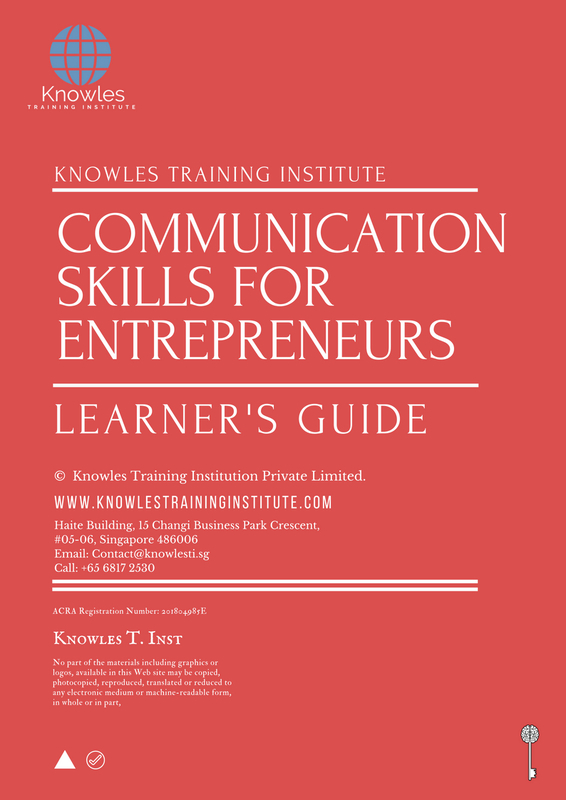 Request for this Communication Skills For Entrepreneurs course brochure. Fill up the short information below and we will send it to you right away! Register For This Communication Skills For Entrepreneurs Course Now! 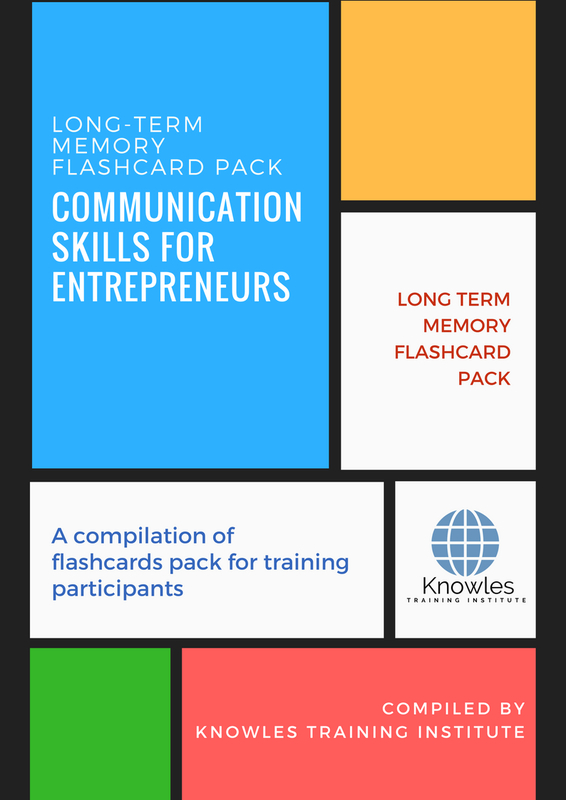 Share This Communication Skills For Entrepreneurs Training Course! Communication Skills For Entrepreneurs course, workshop, training, class, seminar, talk, program, programme, activity, lecture. Communication Skills For Entrepreneurs courses, workshops, classes, seminars, talks, programs, programmes, activities, lectures in Singapore. Communication Skills For Entrepreneurs improvement tips, Communication Skills For Entrepreneurs techniques, improve Communication Skills For Entrepreneurs, improve Communication Skills For Entrepreneurs games, Communication Skills For Entrepreneurs improvement exercises, improve Communication Skills For Entrepreneurs power, how to have good Communication Skills For Entrepreneurs, how to have good Communication Skills For Entrepreneurs in studying, how to build up your Communication Skills For Entrepreneurs, how to improve Communication Skills For Entrepreneurs how to improve Communication Skills For Entrepreneurs course in Singapore. Enhance, boost, build up, enlarge, heighten Communication Skills For Entrepreneurs course in Singapore. Increase, intensify, raise, reinforce, strengthen Communication Skills For Entrepreneurs. Upgrade, amplify, boom, elevate, exaggerate, magnify, grow, gain Communication Skills For Entrepreneurs. 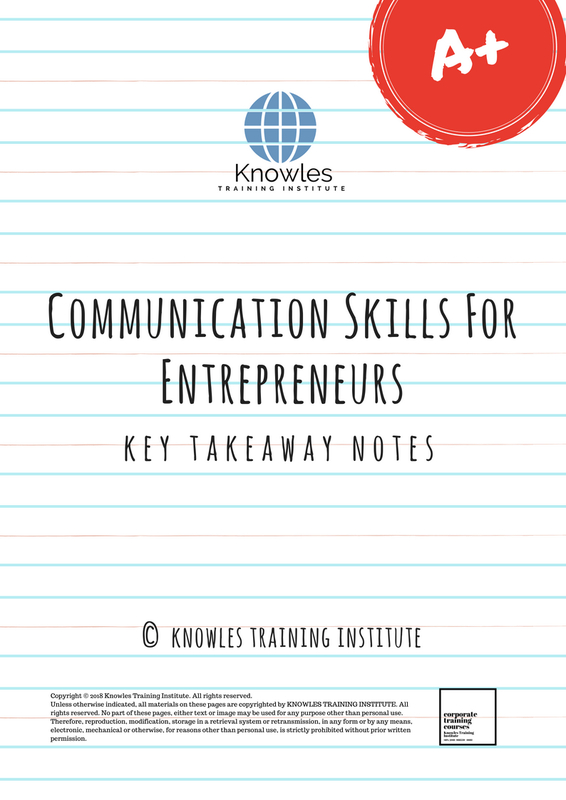 Develop Communication Skills For Entrepreneurs, multiple, power up, beef up, bolster, establish, extend Communication Skills For Entrepreneurs. Invigorate, restore, step up, toughen, empower, fortify, regenerate Communication Skills For Entrepreneurs. 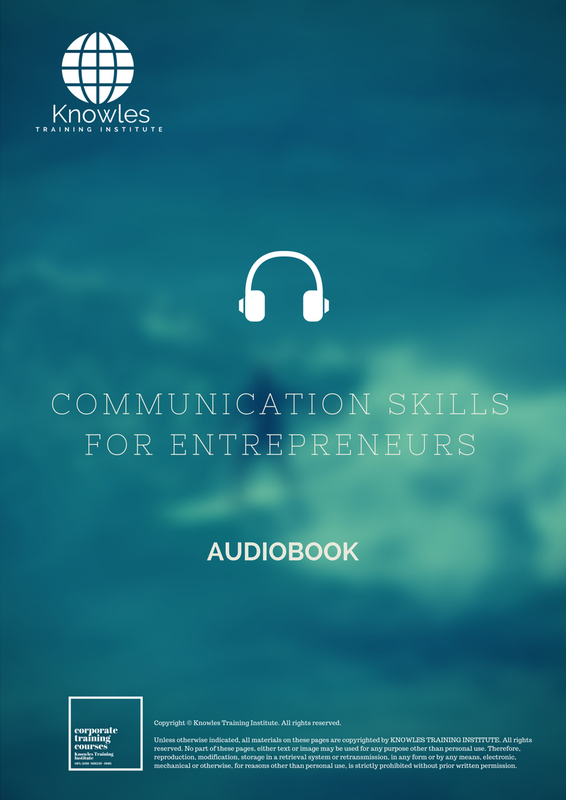 Rejuvenate, renew, escalate, expand, maximize Communication Skills For Entrepreneurs. Powerful, mighty, impressive, competent, great, excellent, exceptional Communication Skills For Entrepreneurs in Singapore. Superb Communication Skills For Entrepreneurs. Super, superior, strong, solid, active Communication Skills For Entrepreneurs training courses and workshops in Singapore. Communication Skills For Entrepreneurs enhancement, booster, building up, enlargement, heightening, increment, strengthening, amplification. Communication Skills For Entrepreneurs magnification, growth, development, power, empowerment, regeneration. Communication Skills For Entrepreneurs rejuvenation, development, escalation, expansion. 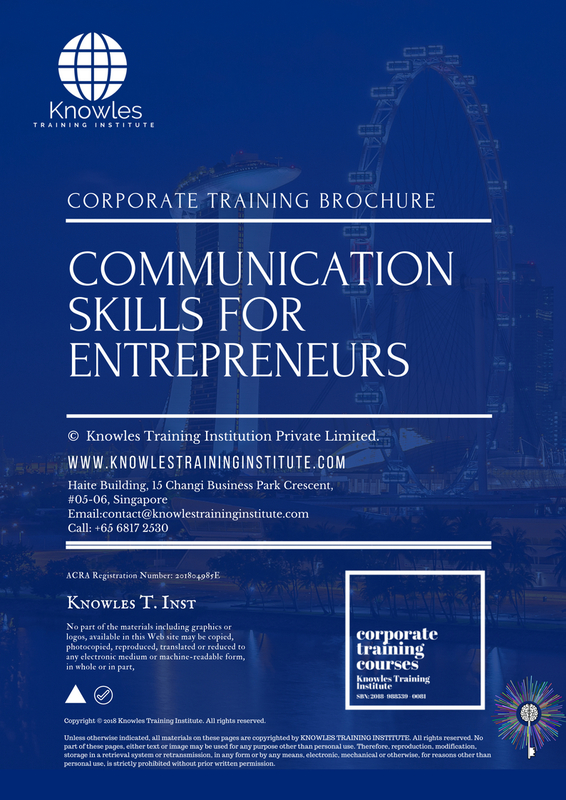 Communication Skills For Entrepreneurs maximization, power training courses & workshops in Singapore.